One of the strengths of Lehman’s On Seas of Glory is his exposure of little known historical events, forgotten ships and obscure naval heroes. One such obscure individual was Joshua Barney. Barney was one of those individuals who seemed destined to greatness in-so-far as the small American Navy could produce greatness, yet to this day his name remains unknown. Here is why. Barney went to sea at the age of eleven prior to the Revolutionary War. It was not uncommon in those days for young boys to begin to learn their trade at an early age. It sounds strange to modern ears but our ideas of what childhood is and is not is a far cry from what was believed in 1770 when young Joshua set sail on a merchant vessel. At age 15 Barney was in command of another merchant ship when the captain died. This says something about Barney growing up fast and learning the trade of sailing when young people today at age 15 are still in High School and most have few responsibilities. After Barney took over the duties of ship’s captain he returned home to find the colonies in rebellion. He signed on to a Continental sloop, the Hornet of 10 guns as a Master’s Mate, a rank just below that of Captain I believe. Sloops and Brigs were low in the pecking order of war ships but they were better armed than merchant ships and so they often served as commerce raiders against enemy shipping or they escorted their own merchant ships against the commerce raiding of the enemy’s sloops and brigs. What of the remarkable things about Barney is that he was captured 5 times by the British and once escaped from the notorious Old Mill Prison in Portsmouth, England. I wish Lehman would have recorded more since being captured by the British as a commerce raider and a traitor to the Crown at that usually meant a death sentence. It wasn’t that the King’s rebellious subjects were lined up and shot or hung but they were usually confined to prison hulks in New York harbor. This was as good as a death sentence because disease took a far greater toll on the Continental Army and Navy than British guns ever did. In any event Barney must have managed to be exchanged (probably for Tories) and after he escaped from prison he returned home in 1782. After the war and the start of the new navy Barney was ranked 4th in the new captain’s list and turned it down because he thought he should be ranked above another captain. As I’ve recorded elsewhere, this was an age of incredible ego and pride and perhaps nowhere else did these “qualities” show than in the American Navy or in the Royal Navy. What Barney did next is the reason he is a foot note in American history rather than someone notable like John Paul Jones or William Bainbridge or Stephen Decatur. Barney had become wealthy during the Revolutionary War due to the prize money he earned. With the money he outfitted a small fleet of privateers. A privateer was a type of legal pirate. Their sole purpose was commerce raiding and most seaman preferred service on a privateer than they did in the American or Royal Navy for the simple reasons that discipline was not all that bad and they stood to make money on a successful cruise. All the seafaring nations employed privateers. Barney’s error was signing on as a French privateer at a time when the US was at war with Revolutionary France. Barney claimed with much justification that he avoided American merchant ships but that avoidance did not endear him to the public. While in command of two French frigates he arrived in Baltimore to take command of a French squadron. He was greeted with derision. To make matters worse the British bottled him up in the Chesapeake for months before he was able to escape, his reputation in tatters for his French connections. When war with Britain finally came in 1812 Barney volunteered his services but was shunned by the US Navy who apparently had a long memory. Barney once again became a privateer and outfitted a 13 gun schooner named Rossie. Obviously Congress only wished to hold a grudge so far which is why they gave Barney the Letter of Marque for his privateer. It was indeed an odd age where your own navy could shun you but yet you could still prosper by legal pirating and be a pain to your country’s enemies. Barney once again was highly successful as a privateer until Admiral Cockburn of the Royal Navy had enough and mounted a successive blockade of the Delaware and Chesapeake. By 1814 the wars with Napoleon were winding down. Napoleon would go into exile but return in 1815 for about 100 days until defeated by Wellington and Blucher at Waterloo. This meant that the Royal Navy was nearly totally free to deal with America and that’s what they did. They blockaded effectively and they sent veteran armies to North America to teach the US a lesson. Since Barney’s privateer was bottled up he volunteered for the US Navy this time via his friend, President Madison. The British had been raiding up and down the Chesapeake in punishing the Americans for their sniping and guerrilla type tactics. Barney was granted a commission to outfit gunboats in an effort to stop them. Gunboats in 1814 were a poor man’s river navy. They usually mounted one gun and were only useful against other gunboats. Barney had a flotilla of them and managed to thwart the British at the Battle of St Leonard’s Creek which says something about where gunboats could be used. The British landed one of those veteran armies under Sir Robert Ross with the intent of launching a punitive expedition against Washington itself. Barney burned his gunboats and took his cannon and sailors to join in the defense of Washington. What followed was one of the most mismatched battles ever fought at Bladensburg, Maryland. The British Army under Ross was made up of Wellington’s Peninsular War veterans, probably the best soldiers in the world at the time. The American Army on the other hand was mostly militia and absolutely no match for British regulars. It took the US two wars with Britain to figure that out but the fondness for militia over a standing army persisted well into the 20th Century. The British made short work of the Americans who mostly just ran away. The only notable resistance came from Barney’s artillery battery manned by his sailors and from the US Marines who supported the battery with musket fire. 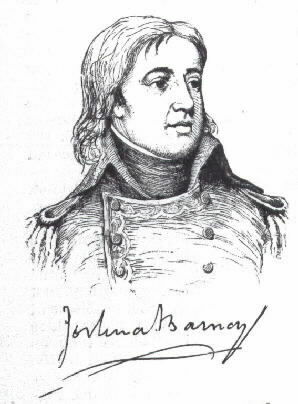 Barney was wounded and captured and treated with the utmost respect by General Ross and Admiral Cockburn which is odd considering the havoc he caused them as a privateer. They paroled Barney after patching up his wounds and Barney’s remaining men proceeded to Baltimore while the British happily burned Washington after the officers enjoyed a meal in the White House after the Madison’s left in a hurry. After the British finished with Washington they headed to Baltimore but found it a tougher nut to crack. It was of course then that Francis Scott Key wrote the Star Bangled Banner from the deck of a British warship as Fort McHenry was bombarded. As a side note the “rocket’s red glare” refers to British Congreve Rockets an innovation that was more psychological than effective. The use of the rockets had added to the stampede of American militia at Bladensburg. At Fort McHenry the rockets didn’t amount to much but did a provide a rather marvelous line in our national anthem. The British General Ross was killed in the land campaign by an American sniper which is too bad for he strikes me as a rather noble and decent man. Barney arrived in Baltimore after Admiral Cockburn gave up and sailed away. In Baltimore Barney finally received a hero’s welcome, his reputation finally restored. He died three years later with a British musket ball still in his thigh. Today however, Joshua Barney remains relatively unknown, yet his contributions to America as a privateer were significant. This summary was gleaned from John Lehman’s On Seas of Glory, Heroic Men, Great Ships, and Epic Battles of the American Navy.